Vishay Intertechnology has today announced that, it is expanding its TMBS surface-mount SMF (DO-219AB) Schottky rectifiers series with 15 more new rectifiers with increased power density and improved efficiency. These new rectifiers are available with a current rating from 1A to 3A, features reverse voltages from 45V to 150V and a forward voltage drop of 0.36V. 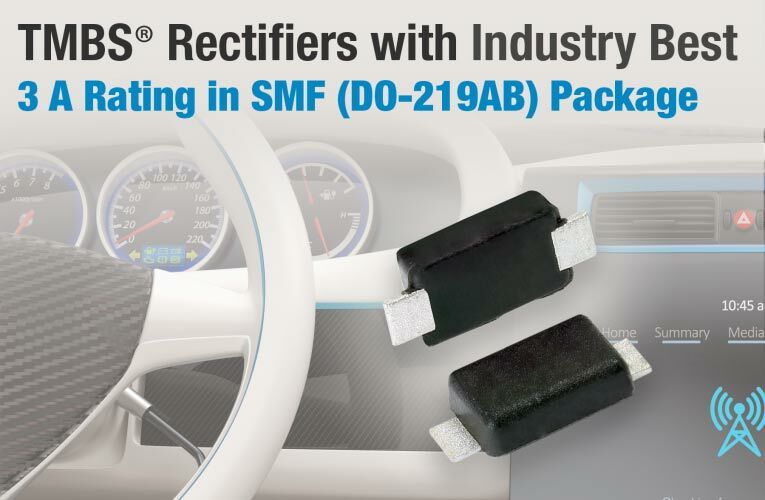 The 3A Schottky rectifiers that are currently available in the market are typically available in SMA package which requires more space, the device announced today comes in a smaller SMF package with the same forward current. The new rectifiers measures only 3.7mm by 1.8mm with a low 0.98mm profile resulting in a package that is 46% thinner than the exiting SMA types. The forward voltage drop of the rectifiers increases slightly as the forward current increases, for instance for 1A the drop is 0.36V, for 2A it is 0.40V and for 3A it is 0.43V. Due to its high efficiency and increased power density the rectifiers can be used in high frequency inverters, DC/DC converters, and freewheeling and polarity protection diodes for commercial and industrial applications. The rectifier is also qualified for AEC-Q101 making it suitable for automotive applications. The new rectifiers features a maximum operating junction temperature up to 175 °C and an MSL moisture sensitivity level of 1 (per J-STD-020) making it ideal for automated placement, the devices are RoHS-compliant and halogen-free. Samples and production quantities of the new TMBS rectifiers are available now, with lead times of 12 weeks for larger orders. For more information on the part numbers please visit their official website.